Which Hearing Health Professional Should You See? What’s the difference between an audiologist, hearing aid dispenser and ENT? Find out in this handy guide to hearing health professionals. Your ears are complicated mechanisms, with multiple parts performing various functions that keep you hearing, balanced and healthy. 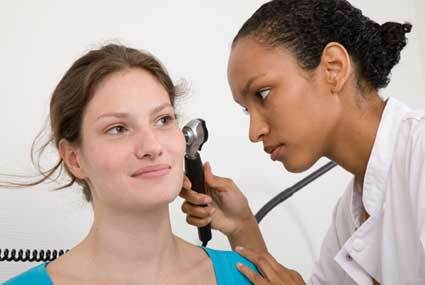 Because of the ear’s complexity, there are various health care professionals who treat ears. If you’re having trouble with your hearing or balance, it may not be clear which specialist you should see. Here is a list of different ear specialists and what they do, to help you navigate the world of ear and hearing professionals. An audiologist is a medical professional with a master’s degree, a PhD in audiology or a clinical doctorate in audiology (AuD). They have been educated and trained specifically to evaluate, diagnose and treat hearing loss and disorders associated with hearing loss, including balance issues and tinnitus (ringing in the ears). Audiologists are licensed by the state to dispense hearing aids or other assistive listening devices, and they will help someone with hearing loss find the right solution based on their lifestyle and budget. Audiologists may specialize in a particular area such as Geriatrics, Pediatrics, Education and Industry to name a few. A hearing aid dispenser (also called a hearing instrument specialist) is a licensed professional who can perform basic hearing tests in order to, select and fit hearing aids. An ear, nose and throat doctor – also known as an Otolaryngologist – is a physician who specializes in diseases and disorders of the ears, nose and throat, as well as the related structures of the head and neck. Sub specialties of an ENT include the professions of Otology and Neurotology. Whatever your concerns are about your ears, hearing, or balance issues, there is a specialist out there who is trained to take care of you. Don’t delay when your ears are at risk – let one of these dedicated professionals give you the help you need to hear your best.